Kindergarten Visits Brazil Without Leaving Their Classroom! Monsignor Slade kindergarten students and their teacher, Mrs. Noteware, traveled to Brazil today--they didn't even need passports! 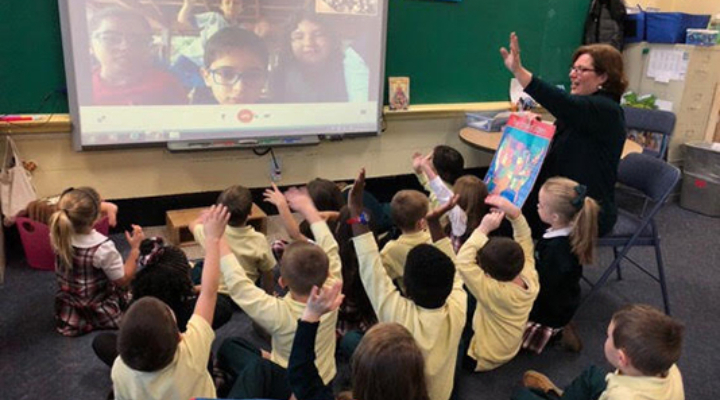 Using live video chat via the Google Global Classroom project, the students in Glen Burnie, Maryland and Brazil introduced themselves and asked each other questions about their schools and favorite things. It was so much fun, the classes plan to meet again after the Christmas holidays! Maybe they will discuss Christmas traditions in their homes and at school.